Just a little reminder about some events going on this evening on the local scene. Since today is Tuesday, Fish Gallery will be hosting their weekly “Drink Like a Fish” event where they will be doling out free alcohol to customers during happy hour. 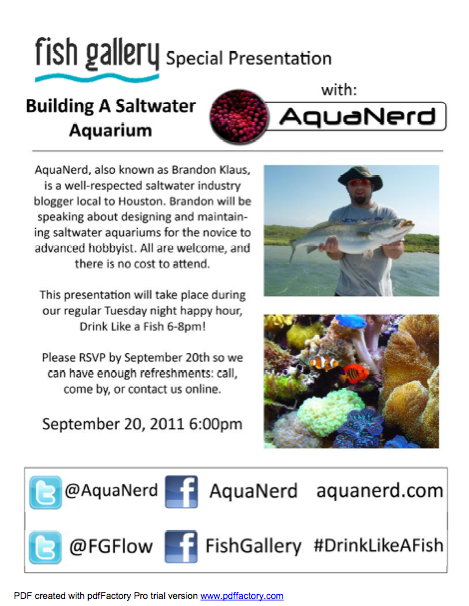 In addition to the free drinks, I will be speaking to a group of potential and new aquarium keepers all about saltwater tanks. For the most part, I’ll just be going over the basics like aquarium equipment, biological and chemical processes, and different livestock, but I’m sure the conversation will wander into reef conservation and wherever the questions take us. So, if you’re local to the Houston area and want a great spot to hang out after work, stop on by Fish Gallery and say hi. The talk starts somewhere around 6 pm and will probably last an hour or more.